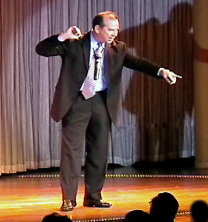 Award-winning comedy magician Doug Anderson is a professional entertainer with over 30 years experience. His highly appealing 30-45 minute corporate friendly, family-style shows have filled cruise guests, company employees, corporate executives and church congregations with side-splitting laughter. Yes, as a matter of fact, he will! If you have a point or two you would like made during the course of the show, no problem. Award-winning comedy magician Doug Anderson can adapt his magic routines to your message and deliver them in such a way, your points are sure to be remembered. While it's true the best seats are front and center, a lot of magicians are particular about where the audience is allowed to sit and won't allow anyone to sit on the sides, edges or behind them. 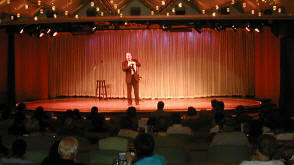 However, Doug has honed his craft to a fine art and can literally perform his comedy magic shows completely surrounded. Easier for you, no problem for him. If you have less than 20 people or well over 600, magician Doug Anderson's magic is highly visible and humorously entertaining. His shows are geared with versatility in mind and can easily be adapted to you and the size of your group.